There is a great article over at LDS Views by Dr. Alonzo Gaskill in which he discusses the differences and similarities between Catholic prayer and Mormon prayer. It is quite interesting the comparisons he makes, particularly those with prayer in the temple. I believe this article is from his latest book Know Your Religions, Vol. 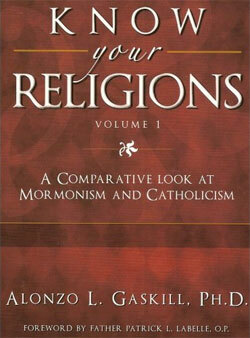 1 – Mormonism and Catholicism. The focus of the article is on Catholic prayer, and that when Catholics petition saints on their behalf it does not mean that they are praying to them. Gaskill explains that praying to anyone else besides God is against Catholic theology. What they are really doing is asking those saints, those faithful followers of Christ, to pray for them, to combine their faith in petitioning God for blessings. In this way, Catholic prayer is similar to LDS prayer in the temple, where faithful members of the Church combine their prayers of faith with each other to make it more effectual in reaching God’s throne. While I have personally witnessed many Catholics seemingly worshiping saints other than God, such a practice does not accord with Catholic teaching. In this case, a benefit of a doubt might be granted, since Latter-day Saints also have practices which don’t accord with our teachings too. My wife once worked for the library at BYU cataloging Mormon folklore, and she could give you a laundry list of interesting practices or beliefs among the Saints. Read the article at LDS Views here.